Global learning company Houghton Mifflin Harcourt has committed to donate books for attendees of 'The Children's Happy Reading Journey Event,' a family event which promotes Reading Fun and Reading Readiness activities for young children. MAITLAND, Fla. - Aug. 25, 2017 - PRLog -- Families are encouraged to bring their Babies, Toddlers, Preschoolers and Elementary aged children out to attend the Free Admission event being held on Sat. Sept. 23, 2017 at the Oviedo Mall Community Room from 1:00pm - 5:00pm which supports the mission of schools with the promotion of reading fun and educational success linked to the love of reading. 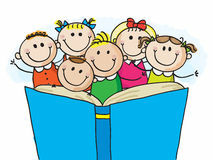 Parents will gain insight into the world of reading fun filled with endless possibilities for their children while also grasping an understanding into the value which should be placed on reading daily to their children and learning how to support that interest with playing an integral role in their child's learning. 'The Children's Happy Reading Journey Event' is focused on demonstrating reading as fun yet, an essential foundation for lifelong learning and academic skills development. Through the wealth of engaging hands-on reading activities for children and the inclusion of participants who will help bring stories to life as they represent their various organizations, this special reading event geared toward young children and their families will offer a unique opportunity for attendees to meet and greet award-winning children's book authors and illustrators, interact with Educators and representatives from local schools and school clubs such as BETA Honor Society Lakeshore Learning Stores and WUCFTV Central Florida - PBS Kids and more that are involved in the event and get up close and personal with the mischievous mascot 'Curious George,' sponsored by Houghton Mifflin Harcourt as an added delight. Guest Readers will also read a variety of stories from the Storytelling /Reading Stage created at the event. 'The Children's Happy Reading Journey Event' strives to convey and reinforce the premise that children learn to read through a variety of mediums which include interactive play, music, movement, rhyme, riddle and song. The concept of how reading skills are aided and developed by these methods will most definitely be captured at this special 'don't miss' event for families and the broader community. The Reading Event shares a 'Happy Reading' experience for all. The event will include Face Painting, Book Giveaways and Door Prizes as a part of the overall experience. Bringing stories to life and having children and their families enjoy it is what this event is all about.